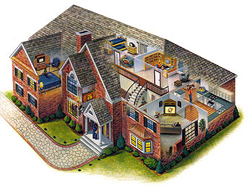 Metroplex Tech provides complete home automation solutions. The back bone of a Smart home (SmartHome) is a quality structured home automation system. Advancements have been made in communications, entertainment and computer technology now allow complete home automation. We can provide you with a properly designed and installed structured home automation infrastructure, utilizing the latest in cabling technology will allow you to take advantage of these technical advancements. It's all about capacity, speed and bandwidth of your cable and wire installation. The home automation infrastructure is the foundation of all voice, video and data communications. It determines what your home automation system is capable or doing. You could have the best equipment in the world but if your home automation can only handle a small fraction of the data then that's all you're going to get, which can limit performance and functionality. So it is important to start with a solid well designed home automation foundation for your home automation, home audio and home theater system. You will need a centralized location in your home to place the home automation panel. This can be a closet or someplace towards the center of your home. 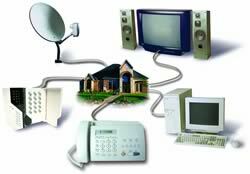 This is also where all the outside services, such as telephone, cable and Internet connect to the home and are then distributed throughout the home. Centralized distribution of all communication systems to one location in the house makes it easier to manage, eliminating the need for extra costly hardware, and avoids excess and unsightly home automation. In most cases two types of home automation are used for home automation. For tv, satellite and digital tv coax will be used. Voice and data will use a category 5 (CAT5e or CAT6) twisted pair cable. Coax is used for tv because it provides maximum protection for your tv signal while cat5e or cat6 cable provides high speed access for your voice and data systems. 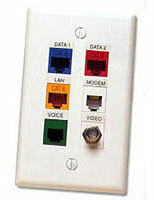 Cat5e or Cat6 is now the preferred cable for home phone home automation due to its ability to prevent crosstalk and be used for other purposes such as computer networks and video communication equipment. Each outlet in each room of your house will generally consist at minimum of one jack for phone, one for a computer network, one for TV and one extra. These outlets can all be customized depending on each room's specific needs or your personal requirements. Home automation requires structured wiring. Just about every new house built this year will have communication and video lines installed. Over 50% of these homes will have these wires installed as structured wiring which is the preferred method. The remaining home owners will rely on old wiring that may not handle tomorrow's emerging technology. If you have any questions about our various Home Automation options for your company please Contact Us or give us a call at: (214) 685-0886.